The most common way to get terminal access to a remote Linux machine is to use Secure Shell (SSH). To work, the Linux server needs to be running a SSH server (OpenSSH) and at the other end you need a SSH client, something like PuTTy in Windows or the ssh command line tool on Linux or other Unix-like operating systems such as FreeBSD. The attraction of SSH is that the connection between the two machines is encrypted. This means that you can access the server from anywhere in the world safe in the knowledge that the connection is secure. 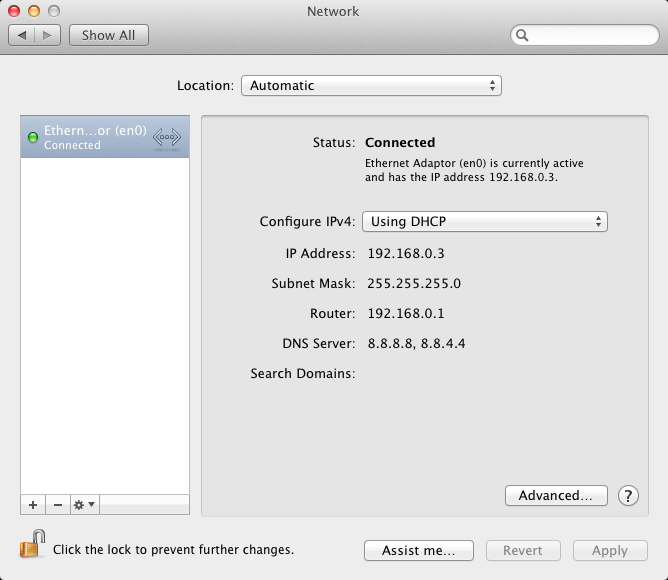 However the real power of SSH is that the secure connection it provides can be used for more than just terminal access. 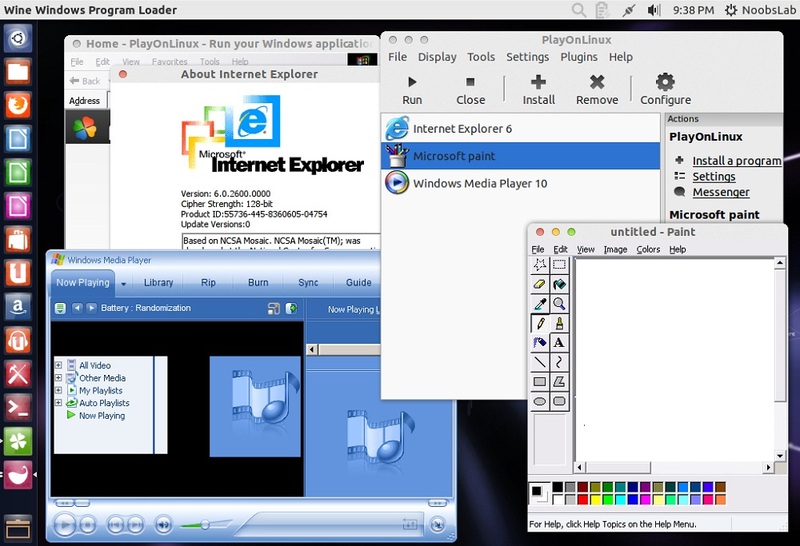 Among its uses is the ability to copy files to and from a remote server. This looks like a fun but potentially VERY dangerous project – we wish the sites linked below had included some common-sense safety warnings for potential builders. Please be conscious of friends and family members (especially the young ones) that might not fully appreciate the danger. If there are drunk people around, hide this thing, preferably under lock and key! 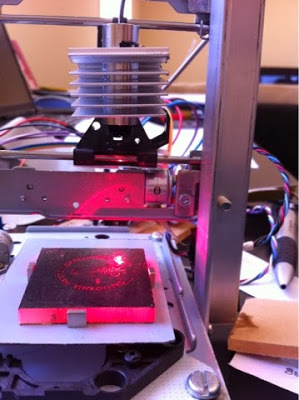 I recently made a mini CNC laser engraver using two DVD drives salvaged from old computers and <$10 extra parts bought on eBay. The controller of the CNC machine is a Raspberry Pi, a $35 credit card size computer. The engraver turns out to be pretty successful. So I am sharing it with everyone. On linux, there are commands for almost everything, because the gui might not be always available. When working on servers only shell access is available and everything has to be done from these commands. So today we shall be checking the commands that can be used to check memory usage on a linux system. Memory include RAM and swap. It is often important to check memory usage and memory used per process on servers so that resources do not fall short and users are able to access the server. For example a website. If you are running a webserver, then the server must have enough memory to serve the visitors to the site. If not, the site would become very slow or even go down when there is a traffic spike, simply because memory would fall short. Its just like what happens on your desktop PC. Do you want to stream video or audio from U.S.-based on-demand Internet streaming media providers but can’t get in on the fun because you’re living outside the U.S.? Fear not, you have come to the right place. Tunlr lets you stream content from sites like Netflix, Hulu, MTV, CBS, ABC, Pandora and more to your Mac or PC. Want to watch Netflix or HuluPlus on your iPad, AppleTV or XBox 360 even though you’re not in the U.S.? Tunlr lets you do this. If you are in the U.S., Tunlr may allow you to access certain sites in Great Britain and elsewhere in Europe. It does not yet allow access to sites in Canada (pity). Again, we are specifically not saying that it is legal to to this, since were are not lawyers and cannot give legal advice. 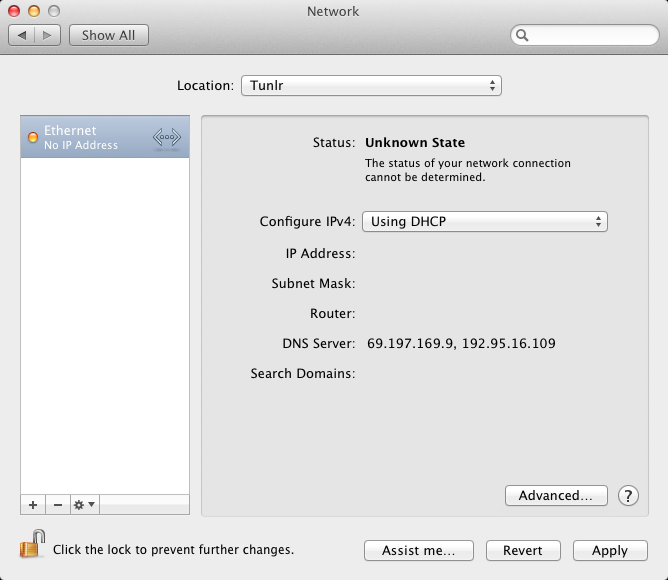 For speed, stability, privacy and security reasons we do not recommend to permanently set your computer’s or router’s DNS addresses to Tunlr. Setting the DNS permanently to Tunlr also puts a heavy strain on Tunlr’s network infrastructure. In order to render the permanent use of our DNS resolvers less attractive, we’re artificially delaying responses to DNS queries. What this means is that your Internet surfing experience will be a lot slower than if you’d just use your Internet service provider’s DNS resolver. However, your ability to download/stream audio or video content is not affected by this delay. To sum it up: do not use our DNS resolver for day to day web surfing. 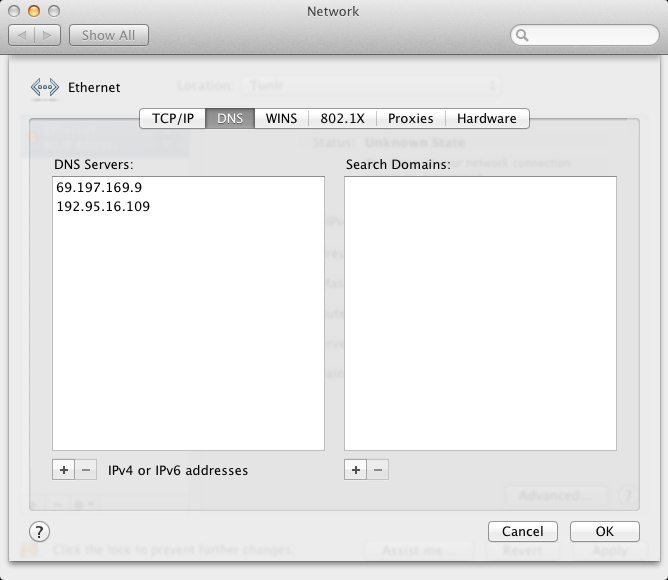 Note that when you switch DNS servers in OS X your network connection will be momentarily interrupted, so you probably don’t want to do this while you have downloads or uploads in progress. This image is from a system with only a wired ethernet connection – you may see additional connections. 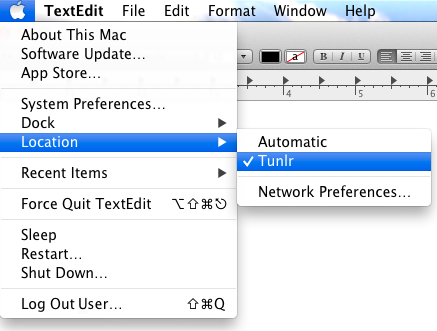 But in the left-hand menu you want to select the connection you’ll be using while using Tunlr, which is probably your wired (en0) connection unless you use wireless exclusively. Note that the dot next to your network connection should have changed from yellow to green. Now open your web browser and go to the Tunlr status page (you can just click on that link). You are looking for the section near the bottom of the page headed Tunlr activation check, which should tell you whether or not Tunlr is activated. 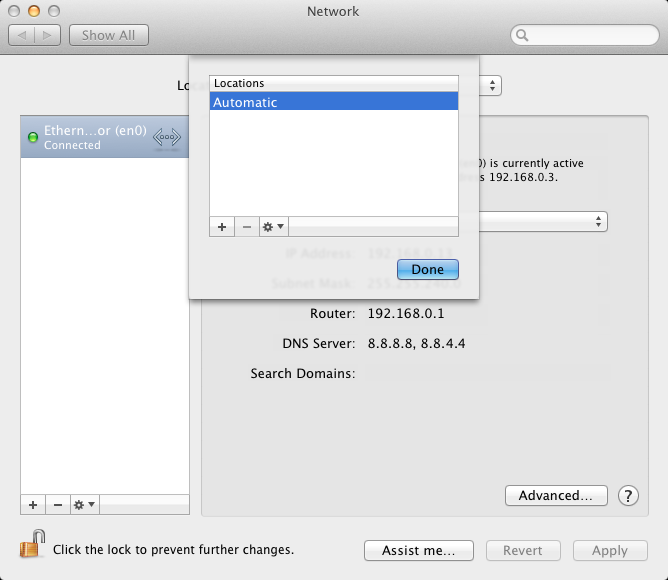 Note that even if it says that you need to restart your device or computer after you change the DNS address, that is NOT true when you use this method. Instead, when you want to access geographically-locked content that Tunlr knows about, you simply go to the Apple menu and select the Tunlr location, and when you are done accessing that content you go back the the same menu and select the Automatic location (or whatever your default location is called). Just keep in mind that any time you change locations, any in-progress communications (downloads or uploads) will be interrupted, and depending on the software and/or protocols used, you may need to restart those connections. Non-US streaming services: BBC iPlayer (excluding live streams), iTV Player, NHL Gamecenter Live and TF1 Replay / WAT.tv (excluding “direct” stream). In my test, Tunlr has worked as advertised, but there’s one issue: using Tunlr DNS permanently is not a good idea: for privacy/security reasons, speed and so on. Even the Tunlr FAQ page says you shouldn’t use the Tunlr DNS for every day web surfing. On Windows, there are some tools you can use to quickly switch the Tunlr DNS on/off, but there’s no such tool for Linux, so here’s how to properly use Tunlr under Linux. Do a Google search like “proxy servers” and you’ll find dozens of PHP proxy scripts on the Internet that will help you create your own proxy servers in minutes for free. The only limitation with PHP based proxies is that they require a web server (to host and run the proxy scripts) and you also need a domain name that will act as an address for your proxy site. If you don’t have a web domain or haven’t rented any server space, you can still create a personal proxy server for free and that too without requiring any technical knowledge. Wireshark is a powerful open source network analyser which can be used to sniff the data on a network, as an aide to troubleshooting network traffic analysis, but equally as an educational tool to help understand the principles of networks and communication protocols. Linux is much better at multitasking processor-intensive tasks than Windows. I remember how virus scanning used to make by old Windows PC almost unusable. Linux is much better, but sometimes bad things happens ! Perhaps a plugin of your browser is using all the CPU, or some bad software is freezing your system, or Apache it’s eating up all your resources on your server. If you have seen some situation like these, don’t worry anymore, you don’t need to kill all the offending processes, restart your graphical session, or even worse restart the computer, you can simply put the specific process in “PAUSE” and analyse the situation, in some cases you could find the cause of a poor performing process, or just restart it in a second moment, maybe after you have saved all your works, when you can give to that process all the CPU.